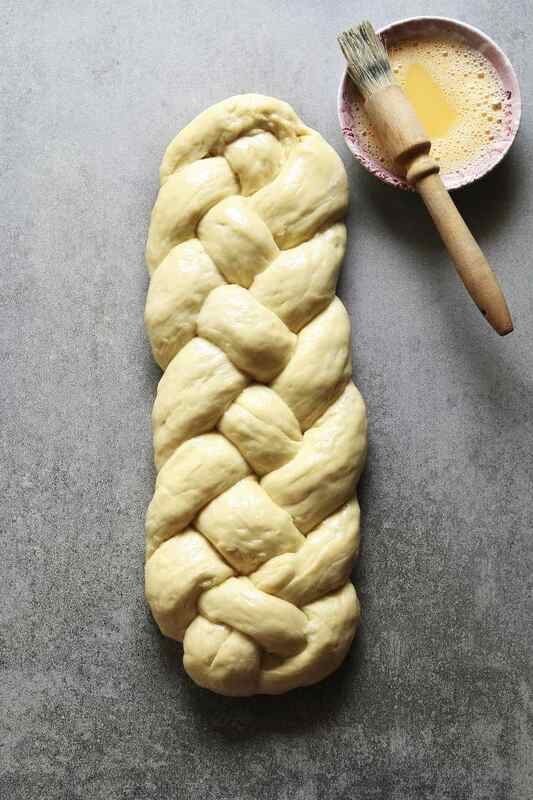 This recipe for Polish chałka (HOW-kah) is a rich, braided egg bread that may or may not contain raisins. It's similar to Bohemian-Czech vanocka, Jewish challah, and Hungarian fonott kalacs. Chalka is served year-round, but especially at Christmas and Easter. If you have any leftover chalka, it makes delicious French toast or bread pudding with orange sauce or makowki (Polish poppyseed bread pudding). In a small heatproof bowl or saucepan, add 4 ounces butter, 1 cup sugar, and 1/2 teaspoon salt to 1 cup scalded milk. Stir to combine and let cool to lukewarm. Place 2 (1/4-ounce) packages active dry yeast and 1/4 cup lukewarm water in the bowl of a stand mixer and, with the paddle attachment, stir until dissolved. Add lukewarm milk mixture from step 1, and 2 large room-temperature beaten eggs, and combine. Add 3 cups flour and beat until smooth. Add 1 cup raisins and remaining 2 1/2 cups flour and mix, about 3 to 5 minutes, until smooth. The dough will be sticky. Place dough in greased bowl. Turn over and cover with plastic wrap and let rise until double, about 1 hour. See this quick tip for faster rising. Punch down dough and turn out onto a lightly floured board. If making 1 large loaf, divide dough into 3 equal pieces. Roll each piece into a strip about 14 inches long. Braid together the 3 strips on a parchment-lined baking pan. Heat oven to 350 F. Loosely cover the bread with greased plastic wrap and let rise until double, about 30 minutes. Brush remaining beaten egg lightly on bread. If making 2 loaves, divide dough into 2 equal pieces and then divide each half into 3 equal pieces, for a total of 6 pieces. Store, covered, at room temperature or slice and freeze or freeze whole if you have room in your freezer.